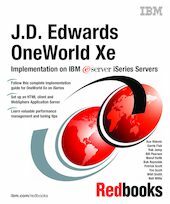 This IBM Redbooks publication explains the specific tasks associated with the implementation of OneWorld Xe service pack 17 on the IBM eServer iSeries server with OS/400 V5R1 and WebSphere Application Server Version 3.5. It is based on a collection of knowledge from J.D. Edwards consultants and IBM professionals who have experience with J.D. Edwards OneWorld Xe and the iSeries server. This book is designed to assist technical people among J.D. Edwards OneWorld customers, OneWorld consultants, business partners, and IBM service representatives. It targets these professionals who are directly involved with the implementation of a total business solution. Such solutions consist of iSeries server hardware, OS/400, DB2 UDB for iSeries database, OneWorld solutions, and supplemental solution products. You should use this book in conjunction with "J.D. Edwards OneWorld Implementation for AS/400", SG24-5195. This publication explains detailed concepts and all implementation steps of earlier versions of OneWorld, most of which still apply to OneWorld Xe. You should also use this book together with the J.D. Edwards manuals that are provided with the OneWorld software.